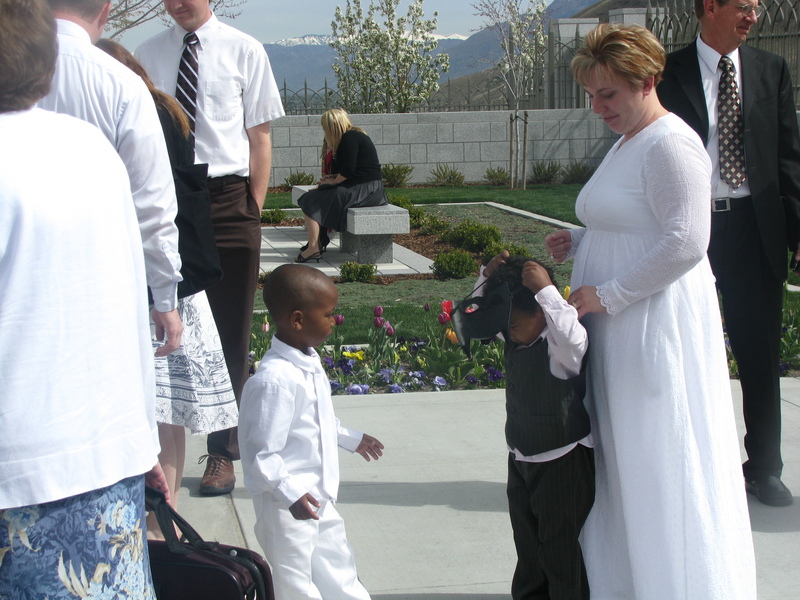 Sis, the Bro-in-Law, and G took E to the temple to be sealed for time and all eternity. It was a beautiful ceremony, even it would have been better if the sealer had talked to my sister’s family before hand–he was honestly confused as to why E needed to be sealed, when Sis and the Bro-in-Law were married in the covenant. That is, until G and E came into the room, and he could see how little they look like Sis and the Bro-in-Law. Okay, I tried to take the easy route, and find a page that would explain sealing. I couldn’t–at least, I couldn’t find a page that explained it in the way I wanted to. We believe that temples are quite literally the House of the Lord. They are the holiest places on earth. We go to the temple to make sacred covenants and ordinances with the Lord. (Covenant: A two way promise between man and God. Ordnance: A ceremony with a sacred purpose–like baptism) When a man and a woman are married in the temple, if they both live worthy, they will be married for time and all eternity. Any children born to them are considered “Born in the Covenant” and will also be a part of their family for eternity. If a couple is married outside the temple they can later go to the temple to be sealed together. If they have children, or, in the case of my sister’s family, if their children were adopted, then those children can be sealed to their parents as well. When G was a baby, he was sealed to Sis and the Bro-in-Law, so he wasn’t part of the ceremony, but was still able to observe. This surprised me a little–the age of 12 is usually the first time a child is allowed to enter the temple, unless, of course, they are being sealed to their parents. E’s biological grandmother was in the temple with us this morning, and his birth mother was waiting outside. This surprised me–both women have a lot more guts than I do. I’m afraid that in their situation, I’d be sitting alone in my room crying. G was glad to see them, though, E has a biological half-brother who’s only a week older than G, and they are best friends. It didn’t take long for them to start running around–including literally running circles around random people. Which of course happened all the way back to Sis’s house. Which was a trick, because they were both strapped in car-seats in different cars. A corgi, or a mostly corgi mutt may look like a small dog, but when she stands up on her back legs, she’s tall enough to steal food of the table. White plastic table covers and bright sunny days aren’t a good combination. At least for those who like to see. If the recipe for your cookies tells you to store them in the freezer, there’s a reason for it. And they shouldn’t be left out on the buffet line on the bright sunny day with the blinding tablecloths. Five of my dad’s eleven siblings were there–including an aunt who lives in Western Nevada, and an uncle from Wisconsin. (If I missed anybody when I was counting, I’m sorry.) It was good to see the family we don’t get to see all that often, even if after I ate and had a few minutes of conversation, I went to check on Max and Lulu and “forgot” to go back. I have an uncle who’s in the hospital, he had a bad car accident a few weeks back, and while his injuries were being examined, the doctors found kidney cancer that had spread through his body. Most of the family had lunch here, then went up to the hospital in Ogden to see him. Dad says he’s in better shape than he was expecting, but still in rough shape. Um, what else? I know I skipped yesterday, and it feels like a ton of stuff has happened since I last wrote, but I suppose I’ve covered all the important stuff. I don’t even really have anything on my mind–except the fact that I don’t want to do any baking for a very, very long time. The lemon bars were a hit. I’d share the recipe, but that would require getting up and finding the cookbook. Seriously, I could change the name of this blog from “The Storyteller Chronicles” to “I Should Be Happy”. I’ve done everything right today. I got up early, after a good nights sleep. I took my anti-depressant. I went to the temple. I cleaned my house and did laundry. I’ve prayed and studied scripture. And I can’t stop crying. I wish I understood why this happens. This morning was amazing. The temple is always a sanctuary–and I felt more at peace there than I have in recent memory. It’s so frustrating. I don’t know how much I can take. President Thomas S. Monson, prophet and leader of the Church of Jesus Christ of Latter-day Saints, announced yesterday a temple is to be built in the small Utah town of Payson. This is big news. It makes me feel vindicated. 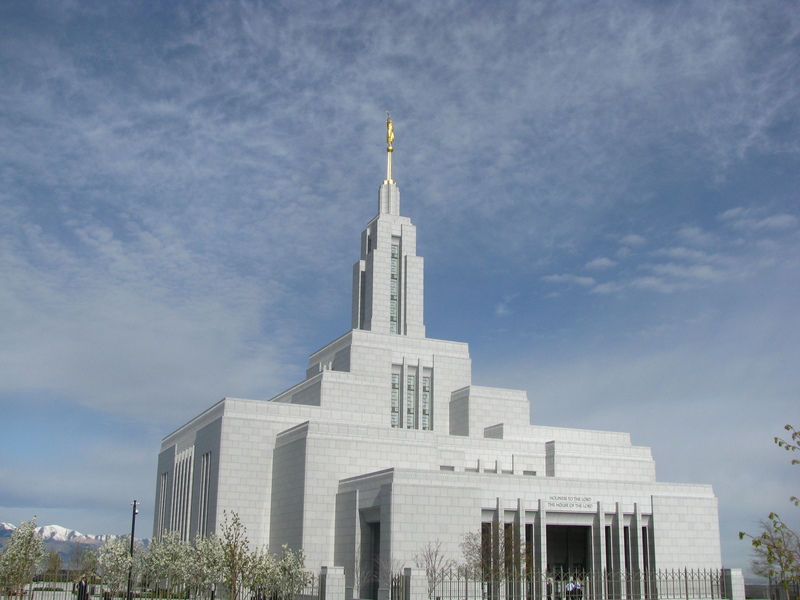 I’ve said for years that eventually they’d build a temple in southern Utah county. Certain people, who, because I know they check this blog on a regular basis, shall remain nameless, dismissed the idea because they thought it would take away from the Manti Temple district. While I’m happy for the people of Payson, and the surrounding areas–this will cut the travel time to the nearest temple by 20-30 minutes, I can’t help but mourn, too. The Winnipeg, Manitoba temple has yet to be announced. The story went, when I was on my mission, that the Church owns the land, most of the supplies needed, and a blueprint prepared for a temple to be built in Winnipeg. Furthermore, when President Gordon B. Hinkley visited central Canada in 1998, everybody expected the temple to be announced. But he addressed the members of Winnipeg, and no announcement was made. He then traveled to Regina, and drove around the city with the stake president. (I heard this story directly from the stake president of the Regina Saskatchewan stake). When he addressed the members of Regina, he announced that the city needed a temple, and one was to be built. I don’t know why Regina got the temple and Winnipeg didn’t. There are two stakes in Saskatchewan, but only one in Manitoba, but there are three wards in Winnipeg, and only two in Regina. Winnipeg is the larger city. I guess it all boils down to the residence of Regina being ready for a temple, while the residence of Winnipeg are not. I remember sitting in a Relief Society lesson in the London ward of Winnipeg, while a ward temple trip was being planned. The presenter mentioned how lucky they were to have a temple so close–Regina is only a six hour drive from Winnipeg. My first thought was how odd–growing up in Utah, I have never lived more than 90 minutes away from a temple. My next thought was, okay–prior to the temple in Regina, the next nearest temples to Winnipeg were in Edmonton, Alberta, or Toronto, Ontario–both about a 24 hour drive away. My third thought was, the sisters need to be doing everything they can to bring a temple to Winnipeg. I don’t know when the temple will be built in Winnipeg, but I know it will be. My time to be helping the members of Winnipeg prepare for the blessings of the temple has long since past, but I still ache for the wonderful friends I made to have the blessing of a temple in their city. Winnipegers, especially LDS Winnipegers, if there are any reading this–please make use of the Regina temple. The best way to bring a temple to Winnipeg is to show that you are using the one you have now. I don’t know how much things have changed since I was a missionary there in 2002-2004, but at that time, you didn’t realize the blessings you were missing out on by not having a temple in your city. Please, do everything you can, and I promise you that you will be blessed. On hope, dispair, and being alone in the sealing room. My parents, sister, brother-in-law, and myself went to the temple today, to seal my great-aunt to her husband and parents. (If I have any readers who aren’t LDS, see this post–I’m also working on a Mormon to English glossary) It was quite the experience–this is the first time that I’ve done sealings. I’d seen them, of course–I’ve witnessed weddings and my nephew being sealed to my sister and bro-in-law. In our group, doing sealings for Aunt Virginia and Uncle Russ, I was the only single person. There were then two other couples doing sealings with us. I had the opportunity to stand in proxy for my aunt when she was sealed to her parents, then, as we did names that other people had submitted, I was the one who was asked to be proxy for the daughters–I was the only one who was asked to be proxy for the daughters. It was hard for me, to hear all of the couples being sealed together, knowing that I was the only one in the room who hadn’t received those blessings for myself in this life. I had to keep reminding myself that it wasn’t the time or the place to feel sorry for myself–instead I should be rejoicing for those who have been separated from their family members for who knows how long. The thing is, I had an overwhelming sense that someday, it would happen for me. On the way home, I was remembering that about two months ago, I volunteered to speak in Sacrament meeting, to share with the ward a new program the stake put out involving the temples, and family history. The stake president heard me volunteer (he just happened to be in our ward that day, I wasn’t planning on him being their, but he he immediately said “This will help you get married.” I thought that was odd, but didn’t really think about it. After giving the talk, I felt like what President Livingstone had said was true, even though I didn’t know–and still don’t know how that talk would help me find a husband. When I was acting in proxy, I felt such a familial love, not only when I was in proxy for my own family members, but when I was in proxy for strangers. It was like being a little child, safe in the arms of my mother. I don’t know how comfortable I would be doing sealings for anyone other than my own family, at least until I have a husband or fiancé to go with me. I’m still glad of the experience. A short post full of long explinations. It’s a little strange to go to church in my parent’s ward. They still live in the house I grew up in, in a small Mormon town, and even though they haven’t moved, their ward boundaries have. With the change in the ward boundaries, things have gotten a little strange for me. First of all, my favorite high school teacher is in my parents ward. Second of all, it seems like a fair number of jocks that I went to high school with have ether moved back to town or never left, and they are living in my parents ward. All this is a very long explanation to talk about what happened in church today. Boo, the star of the high school football team (and yes, that’s what he chooses to call himself) and his wife were two of the speakers in Sacrament today. Boo hadn’t been active in the church when they first met, and they weren’t married in the temple. (Another note of explanation. While the LDS Church recognizes civil marriages, we believe that such unions will end at death. When a couple is married in the temple, we believe that if both spouses stay worthy, that that marriage will last for eternity. However, if a couple is not married in the temple, [and there are some states and governments that do not recognize a temple marriage as legally valid] they can go later to be sealed, which is essentially the same thing. Children who are born to a couple who were married or sealed in the temple are also sealed to their parents and can be a part of their family forever. If a child was born before the sealing took place, or if a child is adopted into a family, they can also be sealed to their parents in the temple. Boo and his wife both spoke on preparing to go to the temple to be sealed. It was a very touching experience for me. I have two callings, (jobs in the church) Relief Society teacher, and Temple Committee co-chair. One of my duties in the temple committee is to teach the temple prep class, to help the members of my ward prepare to enter the temple. My temple prep class has had me discouraged lately. The members of my class are brought in by invitation, and tend to be 19-20-21 year old girls and their recently returned missionary fiancées. (a missionary, male or female, goes through the temple before departing on their mission) The girls, the ones who the class is for, seem to treat it as a joke, or are too shy to comment, so much of the discussion takes place among the fiancées, who have already been through the temple. While this is understandable to a certain extent–we are not supposed to talk about much of what happens in the temple outside of its sacred walls, so trying to prepare someone to enter requires a lot of talk about seemingly random topics that can be difficult to understand unless you have been through the temple, it’s still frustrating. I don’t know how much these girls are taking away, or if they are treating this topic of eternal importance with the gravity it deserves. Which brings me back to Boo. He said in his talk today that the only reason he went to the temple prep classes was because they served refreshments afterwards. He didn’t really take much away, but, when he got to the temple, he realized how much they helped. Granted, I was already emotional because I was feeling overwhelmed by being around so many people, and the past few days have been on the down side of things. (um, not a church explanation, but rather a personal one. “Down day” is my own personal code for a day when I’ve been noticeably more depressed for much of the day) So when Boo made that statement, I started to cry. I needed to hear that just because I don’t think the girls are taking anything out of the class doesn’t mean that they aren’t, and they probably won’t realize how much they needed the classes until they go through the temple, get married and move out of my ward. I’m so glad to have had that reminder. I just would have never expected it to come from that source.